Before registering your rating team (the people you would like to get feedback from) it is recommended that you take the time to make sure that they are willing and able to participate. You will need the email address for each of the raters you choose. Please ensure email addresses are entered correctly. You may use any or all of the rater categories provided, however, you must have at least 3 raters in a category to protect the confidentiality of responses. Manager The person you report to. If you have more than one manager please contact us to discuss the best process to take. Peers (or colleagues) People that work with you. It is recommended to nominate minimum 3, maximum 8. Direct reports (or staff) People who report to you. We recommend including all the people who report to you. Minimum 3 required. Stakeholders Internal or external stakeholders, e.g. customers. It is recommended to nominate minimum 3, maximum 8. Others Any additional raters you’d like to invite who are not covered by one of the other categories. It is recommended to nominate minimum 3, maximum 8. The survey should take 10 – 20 minutes to complete. To access the survey please ensure you are using the email supplied. Make sure there are no spaces included in your password. 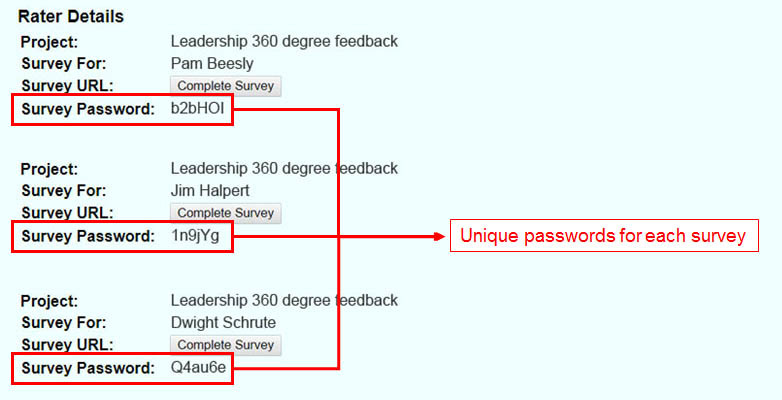 If you are completing multiple surveys please note that there is a unique password for every survey. Your webpage will refresh every 10 minutes when left idle. We strongly recommend that you complete your feedback in one sitting to avoid any loss of data. The manager’s response will be individually identified in the report. All other rater responses will be averaged in groups to ensure anonymity. Free text comments will be reported exactly as written but without names. One of the most critical parts of the 360 degree feedback process is the self evaluation. The self evaluation is key to comparing your view of your own performance to that of the raters who have provided feedback for you. It allows us to better understand the capabilities by which our performance is being evaluated and forces us to identify our strengths and opportunities for improvement. Please note: your responses and your manager’s responses will be identified in your report; however all other rater responses will be averaged in groups to ensure anonymity. Free text comments will be reported exactly as written but without names. Some organisations require you to enter a password before you can access the internet. Make sure you do not confuse your internal processes, username and password with the Full Circle Feedback process, username and password. If you are having trouble accessing the online survey check with your IT department that you have internet access, not just intranet (internal). We can arrange to send you an electronic or paper copy of the survey if the internet is not available to you. Try copying and pasting the password supplied in your email to ensure you have entered it correctly. 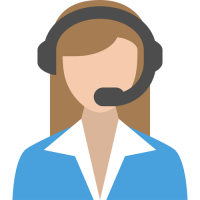 If you would like to make changes to a submitted survey please contact the support team – click here to email. Please note: If you are completing multiple surveys there is a unique password for every survey. While reading your 360 degree feedback report, remember that this process is being used to increase your self-awareness and to supply you with guidance on potential development opportunities. Try to consider the context in which the responses have been offered as this will enable you to better understand what changes you can make to your interactions with specific rater groups. For example, your Manager may rate your communication skills highly but your direct reports may give you a lower rating in this area. Instead of interpreting the feedback as poor communication overall and feeling overwhelmed with the idea of improving your communication with everyone, it’s important to be able to understand the context within your current working relationships. To get the most out of your 360 degree feedback report we highly recommend that you have a debrief session with a professional facilitator so that they may help you interpret the data correctly and advise you on how you can best use the feedback going forward. Ensure that you have reviewed your report and write down any questions or concerns you may have for the facilitator. Your facilitator will review your report to ensure they have captured any major patterns or themes that have occurred with the feedback. Your facilitator will guide you through the meeting. Remember, they are there to help you interpret your report, seek clarification on any point that you are unsure about. They will help you identify key themes and major gaps within your report. They will help you brainstorm options for your improvement and development. They will help develop some specific actions that can form the basis of your action plan. Your facilitator will provide you with an email summary of your meeting and any relevant material that can help with the areas of improvement that were identified. Create an action plan identifying how you plan to develop the key skills you need to improve. Schedule a meeting with your manager to discuss your feedback and take them through your action plan. Don’t forget to thank the people who took the time to provide feedback for you. Before you start creating your action plan, remember that people often feel threatened by feedback. However, pinpointing how other people see your performance actually provides an excellent opportunity for reflection, discussion and improvement. Everyone performs less than perfectly in at least one area but when you receive the feedback you can often feel overwhelmed and don’t know where to start. This is the perfect opportunity to act on areas that you can further develop. The following process takes the ‘guess work’ out and points you in the right direction. While your feedback meeting is still fresh in your mind, take the opportunity to note your initial impressions. Once you start to process and act on the information, your responses will change and it’s useful to revisit your starting point to judge how your leadership journey is going. I am participating in a 360 degree feedback program, which involves seeking feedback about how others perceive me in the workplace. I would like you to be part of my feedback team. You will be asked to complete an online survey that will take approximately 15 minutes. You are encouraged to be constructive and honest. Your responses will be processed by the company Full Circle Feedback, who will prepare my feedback report. Your responses will be reported to me anonymously and confidentially, with the exception of my manager’s responses which will be identified in the report. Please let me know if you are not able to participate. Otherwise, you will soon receive an email from Full Circle Feedback with the survey instructions and contact details for more information. This part of your report shows the global view of the feedback received as part of the survey process. It shows how you rated your own current performance compared with the average response from your feedback team. The feedback team is defined as all those raters who have provided feedback including your Manager/Supervisor. Your own responses are not included in the results of the feedback team. If applicable, your highest scoring area may be listed as a strength in the bottom right corner of this page. This page shows a more detailed view of the feedback by breaking the feedback team results into the respective rater groups such as direct reports, peers etc. Blank segments on the graph represent questions that may not have been seen as relevant and were not answered by the respondents in that particular rater group. This section will appear in your report if your survey question set required ratings for each question on two separate scales – Performance and Importance. This part of your report displays how the feedback team has perceived your current performance and then compares it with how they perceived each survey item in terms of importance to your role. When used, the Current Performance/Importance section can help you better understand any identified gaps between your current performance and what is expected by the feedback team for someone in your role. The Strength Perceptions Report presents a summary of the overall highest rated survey statements based on the average of the responses from yourself, the feedback team and each of the respective rater groups. The behaviours are listed from the highest to the lowest based upon the averages of the feedback team. This section allows you to understand what the feedback team see as your strengths and enables you to use this data to inform your development into the future. The Opportunity Perceptions Report represents a summary of the overall lowest rated survey statements based on the average of the responses from yourself, the feedback team and each of the respective rater groups. The survey statements are listed from the lowest to the highest based upon the averages of the feedback team. This section allows you to better understand the opportunities for your future development activities. yourself, the feedback team and each rater group form what is referred to as the Performance Snapshot section of your feedback report. The first set of tables within the performance snapshot section identifies the most common strengths and opportunities as selected by the overall feedback team. The remaining sections of the performance snapshot section include tables identifying the most common strengths and opportunities as selected by each of your respective rater groups. The number included in the column of each competency represents the number of raters who selected that competency as either a strength or a challenge. A competency that has an (M) in its column indicates that this competency was selected by your manager as either a strength or a challenge depending on the column it is located in. Any competency that has an (S) in its column indicates that this competency was selected by you as either a strength or a challenge depending on the column it is located in. This section of your report is useful in providing feedback on your particular strengths and challenges. Hopefully, it serves as a summary of the picture you have already built after reviewing the other sections of the report. You may also notice that you have the same items nominated as both strengths and challenges. This is an example of how different people may have different perceptions. Your report may include free text comments provided by each rater as part of their response to the survey. Be aware that these comments are randomised and not listed in any particular order. The comments are also presented exactly as they are written. They have not been corrected for spelling punctuation or grammar.